Where in The World will UAS travel in 2018? Where is the World is Upon A Star? You know that the agents of Upon A Star love to make your travel dreams come true. We also love to make our own travel dreams come true - and in 2018, we’re going to live it up! We’re excited to share our travel plans - and, if you’re still deciding where to vacation this year, maybe you’ll find some inspiration! Check out where you’ll find our agents in 2018! In 2018, Michelle will visit Spain! With stops in Barcelona, Valencia, Granada, Sevilla, Costa del Sol, and Madrid, she’s going to see as much of the country as possible in less than two weeks. After living in Spain, Michelle considers it to be her second home, and goes back every chance she can find. More than anything, she’s excited to be surrounded by the culture, to live in Spanish, and, of course, to eat as much Spanish food as possible. She’ll be in Spain in June! Kyla is going to one of her favorite spots in the world in 2018 - Jamaica! She love the people, the food, and the beauty of the island. The people are incredibly kind and friendly - a member of the hotel staff that she befriended on her last visit brought her mangos from her own yard every day! Kyla can’t wait to have Jamaican food - fresh fruit, jerk chicken, and a Red Stripe have her name on them! And, she loves the mountains, the palm trees, and the crystal clear, warm water - it’s a huge change from her local waterways in New England! Kyla will be in Jamaica in May! Joy is having a European adventure in 2018! Her daughter has been an Irish dancer since she was in first grade, and she and her family have wanted to go to Ireland ever since. This year, for her daughter’s 18th birthday, they’re making their dream come true! While Ireland is a definite, they are considering also going to Great Britain, Scotland, and France. Joy’s daughters are excited to see the Warner Brothers tour in London and the world’s largest collection of books in Dublin - and Joy and her husband are excited to drink in the scenery...and a pint a the local pubs! Joy will be in Ireland in July! Tracey is taking her family to Disneyland in 2018! This is a first trip to Disneyland for her two sons, who are super excited to see Cars Land! They are also excited to have the chance to visit their family in California. Tracey will be in Disneyland for Easter! Kelly and her husband are headed to Paris in 2018! She is excited to see the Eiffel Tower and other must-see sites, but Kelly is also looking forward to visiting Monet’s gardens to see the inspiration for so many of his paintings. She and her husband will be celebrating their fifth anniversary in the City of Lights in May! Patti and her sisters will be in Disneyland in 2018! This is a first visit for Patti, who is looking forward to experiencing the Disney magic in California! She’s also excited to have a getaway with her sisters. She’ll be there for her next birthday - another reason to be excited! Sarah will be visiting Ireland in 2018! She’s super excited to visit her family’s castle, and to see where Last Jedi was filmed! Ireland has been on her travel bucket list forever, and it’s finally time to cross it off. She’ll be there in the fall! Lori is hosting a group trip to Mexico in 2018, and she can’t wait! She loves Mexico, and loves introducing it to other travelers through her group trips. She hosts several a year, and is always welcoming new travelers to her groups. Her first Mexican adventure of the year will be in February! This isn’t Carrie’s first trip to Disney World, but it comes with a special feature - she’s going to see her daughter perform! Carrie is super excited to see her daughter’s marching band and choir performances, which will add a new, fun element to her Disney experience. She’ll be there in April! Jodi will be with Lori on the group trip to Mexico in 2018! She’s super excited to relax and recharge in Cancún, and to gear up for a year full of travel! She’ll be on the beach in Mexico in February! Lindsay and her family are headed to all-inclusive paradise in Mexico in 2018! 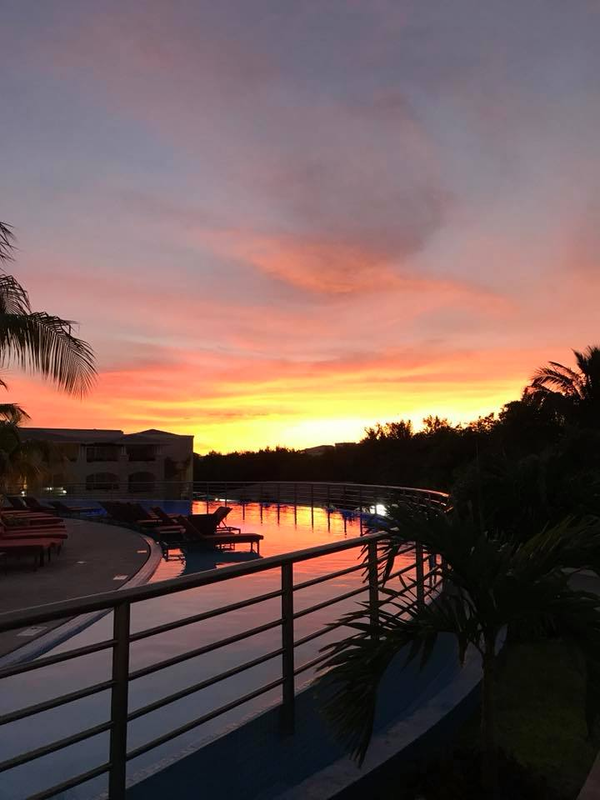 She chose the Grand Moon Palace Resort in Cancún for its family-friendly amenities - and the direct flight from Pittsburgh to Cancún was definitely a factor! She and her family will be soaking up the sun in March 2018! Your agents are traveling to amazing destinations in 2018! We can’t wait for our own trips, and we hope you’ve found some inspiration from our plans. We’ll share all the details when we get back - and, as always, we can’t wait to help you make your travel dreams come true! September 7, 2016 Upon A Star Travel & Concierge . Disney is supposed to be FUN!...not stressful. You don’t have to plan everything in a day. Yes, you can plan every little detail all by yourself, or you can us a Travel Agent to help you with as much (or a little) as you want. Whether you’re a go-with-the-flow type or a total “type a”, a TA can help you with the ins and outs and constant changes of Walt Disney World. 1- Travel Agents are FREE! Yes, you read that right. Most travel agents are free! It doesn’t cost you a penny more to book with an agent than with Disney directly. Disney pays the agency a commission, but the price to you is the same. So support your friends, neighbors and local businesses – book with a travel agent! 2- They’ll monitor your vacation for discounts and deals. When a sale or promotion comes out your TA will automatically “apply” the new deal, if it’s available for your resort/dates. 3- If you don’t want to do your own dining reservations, your agent will. They get up at 6am FL time, 180 days in advance while you sleep in. You can also do them, if it makes you happy; they can help you figure out which restaurants are a good fit for your family. 4- Your TA can help you find the right resort for YOU! Everyone’s vacation wants, needs and budget are different. There are hundreds of options to choose from. Driving vs flying makes a difference. Pre-Schoolers vs teens makes a difference. As your TA sees your needs, they can come up with the right resort and save you dozens of hours doing research. 5- Your TA can help you pick you park days to maximize your fun time vs your line time. We have many tools to help us predict which parks will have less crowds over other parks. This means less wait for rides and entertainment so you can do more! 6- Your TA can help with the Disney Dining Plan. Is the dining plan beneficial for my family? Did I over book my credits? - Your TA will help you with those questions and help you get the most out of your dining credits. At 60 days out your travel agent will get up at 7am to make your fastpass reservations for you, while you sleep in or are getting the kids off to school. Or if it’s fun for you, you can book them yourself. You TA can help you figure out which rides are best to get passes for. 8- Your TA can help you with an itinerary. At Upon A Star Travel and Concierge we will send you a personalized itinerary to help you navigate through everything that has been pre-booked for you. It's your guide to fun! 9- Your TA has some tip and tricks up their sleeve. Our agents are regular Disney goers. We’ve got a few things we’ve picked up along the way. From ways to save to surprising your kids with some “pixie dust” while your there, our knowledge can really help make your trip more magical. We are constantly educating ourselves and doing everything we can to be your experts! Even if you have already booked, you can TRANSFER your existing reservation to a Travel Agent. If you booked within the last 30 days and have not paid in full, your trip can be transferred to a TA to take advantage of their services. There are a “few, uh, provisos. Ah, a couple quid pro quo.” The only thing you cannot do with a TA is modify your reservation- change, cancel or move dates, through Disney. You must do this through your TA and they are no more than an email away. I used Walt Disney World as an example of the many ways a Travel Agent can make your Disney vacation less stressful, but we apply this same level of service for all of our destinations and bookings. Whether it's Walt Disney World, Disney Destinations, Cruises, group travel, All Inclusive vacations and many more, you will get the same expert service every time! Contact your Travel Agent to help you book your next Magical Vacation!! !